-Thoroughly revised and updated, Medical Office Procedures is a text-workbook that introduces and describes the tasks of a medical office assistant's career; teaches records management, medical communications, and scheduling skills; and describes procedures for preparing patients' charts and bills. NEW Simulated Medisoft v17 Exercises Medisoft v17 practice management exercises are now simulated in Connect Plus, McGraw-Hill's online assessment and assignment product. No software installation required. Chapter 3 on Communication has been split into two chapters (“Verbal & Nonverbal” and “Phone, Mail, and Scheduling”) to accommodate more detailed information. Coding chapter has been updated to include most current ICD-10-CM codes. (ICD-9 information will be available on the Online Learning Center. Several Projects have been added or updated to incorporate more student practice and exposure to a wider variety of skills and tasks. All content is linked to Learning Outcomes. Learning Outcomes are tagged to Bloom's Taxonomy, all end-of-chapter and test bank questions are tagged to learning Outcomes, and Chapter Summary in a tabular, step-by-step format with page references. Correspondence, scheduling, financial, and records projects in each chapter provide hands-on practice with concepts and skills. Files for letterheads, patient information forms, and statements for chapter projects and simulations are delivered online via CONNECT Plus and the Online Learning Center. Simulation recordings, also available online via CONNECT PLUS, contain recordings for the two simulations of medical office conversations, instructions from the doctor, incoming and outgoing phone calls, interruptions, and the doctor's dictation for transcription. Instructor's Manual contains teaching notes and resources, AAMA/AMT/NHCSSP correlation charts, and answer keys. EZ Test test generator and PowerPoint presentations are available online through CONNECT Plus and at the Online Learning Center. Working Papers at the end of the text include medical histories, handwritten drafts, correspondence, and other forms needed to complete projects and simulations. 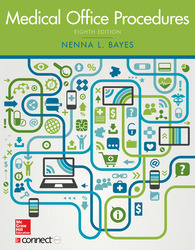 Health Information Management Association (AHIMA). camping in her leisure time.